Le Sutra – the sister concern of the Palm Beach Hotel that recently opened the doors of its heritage wing, the Andhra Arts and Crafts Hotel in Vishakhapatnam, hosted an Andhra art and culture experiential in Mumbai today. The evening included a live art demonstration of the Etikopaka craft, a culinary experience of Andhra Pradesh and a digital walk through of the Andhra Art & Craft Hotel. 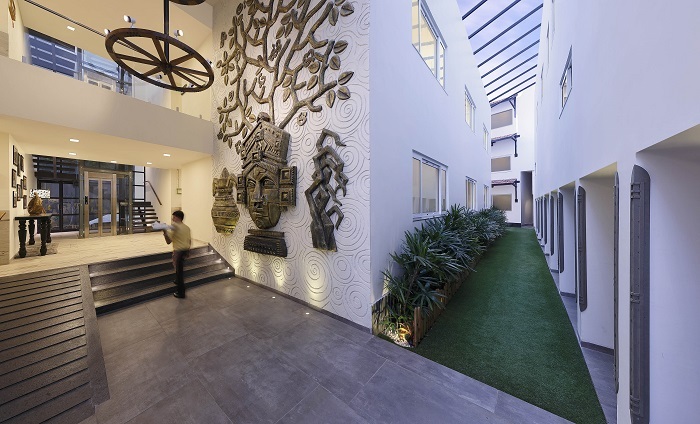 The new wing is a ‘Microcosm of Andhra’ in itself and boasts of 70 sculptures and 50 art installations that weave the narrative of Andhra’s arts and crafts all through passages, corridors and residential areas of the Hotel, making it the world’s first handicrafts Hotel. Owning the title of the world’s first Indian Art Hotel based in Mumbai, the Le Sutra Hotel, is designed on the three GUNAS or qualities as defined by ancient Indian philosophy, namely - TAMAS, RAJAS, and SATVA. Each room in the Hotel is a unique representation of the three GUNAS giving guests a never before seen experience. Taking forward the lineage of Le Sutra the Andhra Arts & Crafts Hotel is its third landmark project, the other two being the world’s first Indian Art Hotel and Tribal Art Homes, aims to preserve and bring forth the local craftsmanship of Andhra Pradesh. The Andhra Art and Craft Hotel is designed exclusively by Andhra national award-winning artisans, interior designers, craftsmen and sculptors. The property has all its rooms themed on craft forms like TholuBommalata or leather shadow puppetry, Budithi brass work, Kalamkari pen art and Etikoppaka toys to create an evolved aesthetic expression encompassing the #HeartofAndhra. The Hotel promises to be a unique destination not only for leisure but also for business and corporate travellers looking for an experience after boardroom hours. Some of the amenities provided by the Hotel include a secure private beach that stays open 24/7, an outdoor swimming pool and four in-house restaurants; Dusk – A Lounge Bar, Masala Mafia, Mafia Bar and Sea Deck where guests can indulge in speciality cuisines. To enhance the Andhra experience, the Hotel has curated a special Andhra cuisine exclusive to the Andhra Arts & Crafts Hotel guests. Additionally, each guest is presented with a souvenir at the end of their stay that represents the art and craft of Andhra. The Hotel is also looking to add an Andhra Crafts gift shop with artefacts curated from local artists and craftsmen. With the additional 24 boutique rooms, the property has joined the ranks of 50 art hotels the world over and holds its uniqueness by being the only handicrafts Hotel in the world.